Return to Education Newsletter main page! ​​​To promote literacy and the love of reading by building free book exchanges worldwide and to build a sense of community as we share skills, creativity and wisdom across generations. Above is the mission statement of the Little Free Library, a nonprofit that spearheaded the idea for neighborhood lending libraries between neighbors with the goal of promoting literacy! Little Free Libraries exist all over the world, even in places you might not expect, like Wilson, Arkansas. In fact, there are over 40,000 Free Little Libraries in use at this very moment. These libraries share millions of books annually and aid in the promotion of literacy. To find out if there is one near you, you can search your state or zip code using their map! But there is no such thing as too many Little Libraries for one area. If there is already one in your area, it will not hurt to make another or to fill the existing ones with Jewish books, especially with Jewish Book Month right around the corner. If you are just itching to make a Little Free Library, here is your opportunity to create your synagogue’s very own little library in honor of Jewish Book Month! Participants can take a book out of the library as well as leave one behind that they finished. Here is a link to a blueprint for a Little Free Library. With these designs, you can create a little library for all of your religious school students and everyone else to enjoy. It comes complete with a supply list and how-to-guide that anyone with a saw can follow! Once it is complete, you can invite parents, congregants, or students to donate their favorite books to fill it to the brim! Or you can stuff it will books from the synagogue library that you want to get more people to read. 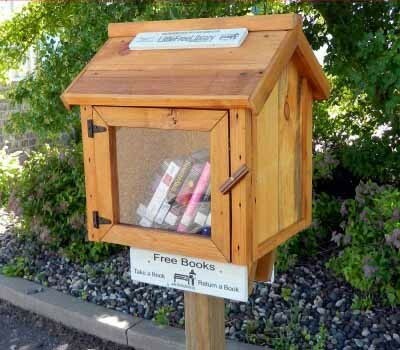 Each month you can switch out the books found inside to invite more people to take advantage of your Free Little Library. Grab a book, leave a book and let the lending begin.